We started Day 2 of My Selangor Story 2013 (MSS2013) early. After having our breakfast at The Buzz Café in Premiere Hotel, we checked out of the hotel and boarded the bus to go to Klang town for a Heritage Walk tour. Safri, the group leader and tour guide for MSS2013, led the group around town. Our first stop was Klang Railway Station. There’s nothing much there apart from its historical value as it was built in the late 19th century. Okay, that sounds wrong, haha! What I mean is that unless if you’re into local history or into trains or train stations, Klang Railway Station is probably going to be just another train station to you despite the fact that it is more than 100 years old and full of history. I guess most of us would think that way, don't you think? Us Malaysians really need to learn to start appreciating our heritage more. At the station, however, I noted that the local municipal council of Klang has done a good job in trying to promote places in the town that is of great heritage value. There are maps and plaques at these places telling stories and their history, which means that anyone can do this Heritage Walk tour on his/ her own without any need for a tour guide or a transport especially if you just decide to hop on a train (KTM Komuter) from say, Kuala Lumpur, for a day out in Klang. So really, kudos for the great effort, guys. It would be great too if there could be information in Malay, which would certainly help locals who are not well versed in English. After Klang Railway Station, we walked along a street lined up with old 2-storey buildings towards Gedung Raja Abdullah (Raja Abdullah Warehouse). Built in the mid-19th century, this warehouse was actually both a residence and a warehouse for Raja Abdullah. It was turned into a government office building by the British during the last quarter of that century. Since then the building has also served as a museum for various old treasures and as a police station as well before it was converted into a tin mining museum. The place, however, is closed at the moment for some restoration and refurbishment work. From Gedung Raja Abdullah, we walked just next door to Klang Fire Station. Klang Fire Station was built in the late 19th century and despite some changes made to accommodate modern day’s requirements, the building structure has remained more or less the same as it was from more than 100 years ago. And it still is a fire station even today. You can feel its history by just walking around the inside of the building. We were already on the bus getting ready to leave for our next stop when we realised that one of us was missing. "Citra has gone to the Hindu temple, I think", answered one of the guys when asked by Safri. We left Klang Fire Station without Citra. Everyone was quiet. Next, we went to Sri Nagara Thendayuthapani Temple which, having being built to serve as a place of worship for early immigrants from India, is the oldest Hindu temple in Klang. The temple is still very much in use to this very day and is considered as one of the most important cultural and heritage sites in Klang. There we found Citra, sitting in the temple, deep in conversation with one of the worshippers. "This guy is cool", I thought to myself. From the temple, we were going to walk to Raja Mahadi Fort, which is another historical place in Klang. 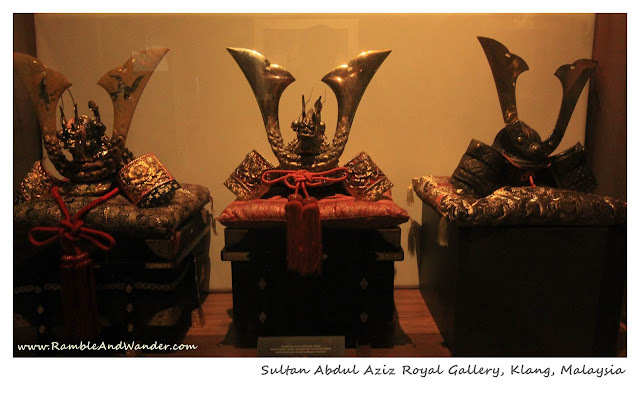 Unfortunately, we had to backtrack and head to Sultan Abdul Aziz Royal Gallery instead as apparently we had an appointment at the Royal Gallery. Sultan Abdul Aziz Royal Gallery is housed in Sultan Suleiman Building, which was built in the early 20th century. The building originally was a government office during the British rule. It was also used as an office by the Japanese during their occupation of Malaya. 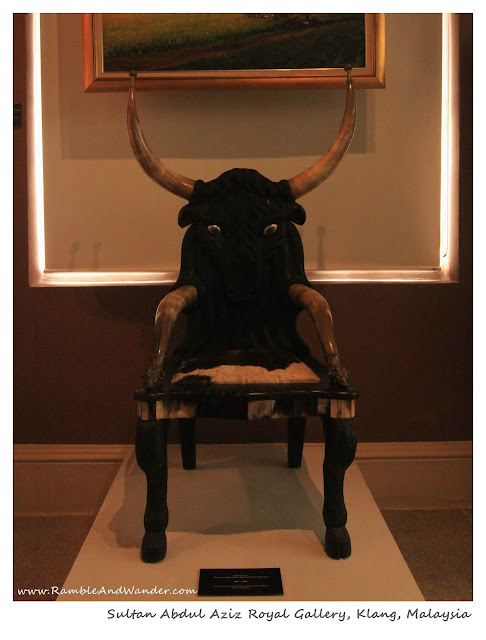 Later on, it served as the office to various government bodies before it was finally restored as a Royal Gallery by the current Sultan, the state ruler. Visitors will get to learn about the life of the late Sultan Salahuddin Abdul Aziz Shah (the father of the current Sultan of Selangor), from his childhood to his appointment as the 8th Sultan of Selangor and eventually as the Yang Dipertuan Agong (Malaysia’s Supreme Ruler) in 1999. The Royal Gallery also houses interesting and unique Royal Collections, some of which are quite quirky. Photography actually is NOT allowed inside the Royal Gallery but our group was lucky to be given the permission by the officer-in-charge to take some photos of the exhibits during our guided tour. As usual, bloggers being bloggers, we just couldn't stop snapping photos away. From the Royal Gallery, we headed to Tengku Kelana Street, which is also known as Little India of Klang. 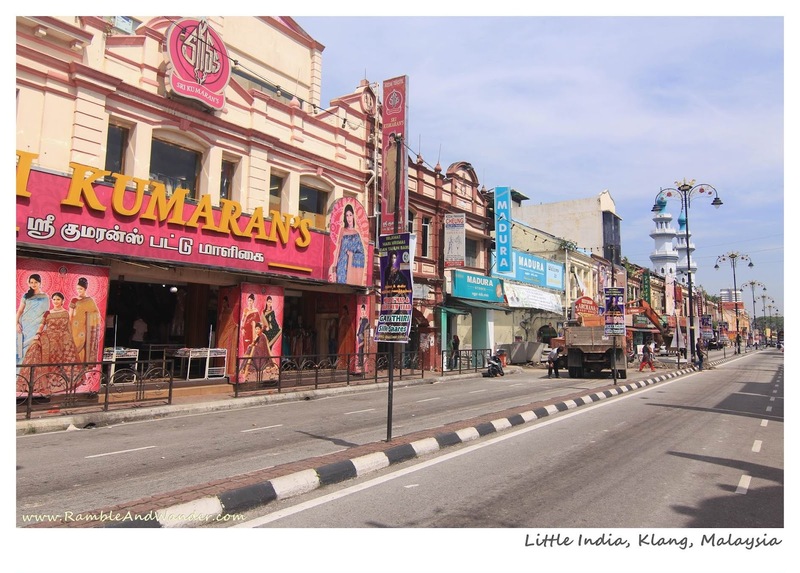 This Little India purports to be the largest Little India in Selangor if not in the whole of Malaysia. A very colourful place, you can find almost everything that you need and possibly even more here. Being Little India, there are more shops selling Indian ethnic-related items here though. You would be spoilt for choice here especially if you’re planning to buy saris, imitation jewellery and Indian delicacies. You can also expect some loud music playing from the various shops. I guess it's one of the things which you either don't like it, or you just embrace it. One of the guys in the group, Husni, apparently decided to embrace it and started showing some Bollywood dance moves on the side pavement. Unfortunately (or fortunately?) no one else from the group decided to join him on the dance floor despite some cool, smooth moves by our Mr Bollywood. From Little India, we stopped briefly at Church of Our Lady of Lourdes (another one of the oldest religious building in Klang). Once we got down from our bus, we realised that Citra has gone missing again. There were looks of disbelief all around. This time though he didn't leave us, we actually accidentally left him at the previous stop, haha! After a call or two by Safri to give him directions, we saw Citra running towards our bus. "This guy is seriously cool", I thought to myself. We left the church after making sure Citra (and everyone else) was with us. Our next destination was Jambatan Kota or Kota Bridge, a double-decked bridge built in the 1950s to improve the traffic flow at the time by letting automobiles on the upper deck and cyclists and pedestrians on the lower deck. This was also just a short stop for a photo opportunity before we drove towards Kwan Imm Buddhist Temple. Kwan Imm Temple, which is a Buddhist temple, was built in the late 19th century. Believe it or not, this temple was slated for demolition a few years back for a new development project but with the help of the Sultan of Selangor, this place is now preserved as a state heritage building. Hearing and reading stories like this, which unfortunately seems to be occurring more and more in Malaysia, really saddens me because it seems like in our race for development and modernisation, not only we tend to forget and fail to appreciate our own culture and heritage, we also appear to be more than happy to banish and demolish them. What gives? What are we going to tell our children and grandchildren about our root and history? Anyways, I digress. There are actually a few more places in Heritage Walk tour which we didn’t get to go to due to time constraint. Among others, they include Alam Shah Palace, the old Chartered Bank building and Masjid Diraja Sultan Suleiman (Sultan Suleiman Royal Mosque). I personally would have loved to visit these other places but it was well past noon then and I guess Safri must have noticed the hungry look on the faces of the MSS2013 group by then that he decided to bring us back to Little India for our lunch at a curry house. 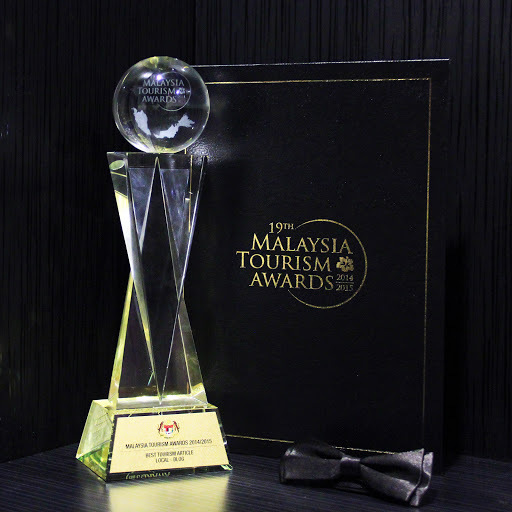 For all other blog entries on My Selangor Story, click here. Oooooh... very nice photos... keren sekali, Bang!